“When I look back today, as I find myself doing more often now that I have sons of my own, I realize that it was during one of these trips to the river that our lives and our world changed.” At the beginning of Chigozie Obioma’s debut novel, The Fishermen, Ben, the story’s narrator, tells us why memory matters: to care about the future, he suggests, is to care about the past. History is what we have — and what our children inherit — to manage hard times ahead. When the novel begins, Ben is nine years old. He lives with his three brothers — from youngest to oldest: Obembe, Boja, and Ikenna Agwu — in Akure, Nigeria in the 1990’s, when the country’s government was wracked by corruption and its economy was in shambles. The Agwu brothers enjoy an unspoiled middle class childhood, until they visit the Obi-Ala River against their mother’s wishes. There, they meet Abulu, the village madman, who makes a terrible prediction: Ikenna, he says, will be killed by one of his siblings. In this view, The Fishermen is a straightforward historical allegory. The four brothers are placeholders for Nigeria’s ethnic groups, and Abulu’s prophecy stands for British colonialism, which forced the unification of historically distinctive peoples. Colonial borders were (aside from British economic interests) absurd yet brutally impactful. They changed the plot of history. But, as Naomi Sharp writes for The Atlantic, the novel is powerful for its messiness: it upends any one-to-one correspondence between literary figures and the history they stand for. 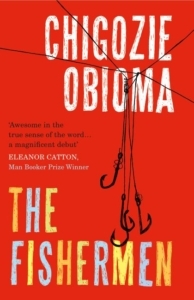 The Fishermen is less an allegory than a story about our desire to fit the past into one. I imagine Ben recalling his childhood for a circle of young people, who sit with their eyes wide and legs crossed, listening intently. As if performing aloud, he uses parable and metaphor to weave his memories into myths. This approach calls attention to the novel — and history itself — as a product of oral literature, the experiences we hold on to and ways we recount them. Abulu, for instance, may be a symbol of British colonialism, but he is also a complex, three-dimensional character. The madman’s ability to tell the future “rattles the lives of many.” He predicts a fatal car crash, foresees a robbery, and discovers a kidnapped girl. But surely some, if not all, of the madman’s power comes from the fact that people believe him. After Ikenna hears the prophesy, he becomes paranoid and aggressive, and his brothers respond in kind. Madness proves contagious. Because the causes of familial and national suffering are complex, Ben cannot settle on one version of the past. He pursues a number of backstories, which broaden the novel’s historical critique. In one flashback, the brothers attend a rally and receive a calendar from M.K.O. Abiola, a wealthy businessman who ran for Nigeria’s presidential election in 1993 — before a military coup intervened and General Sana Abacha declared himself head of state. In the novel, the brothers cherish their calendar as a reminder of “the man almost everyone . . . believed would be Nigeria’s next president.” But Ikenna tears the artifact to shreds. Here, Obioma draws a parallel between Ikenna’s descent into madness and Gen. Abacha’s ascent to power. Ben’s brother stands for a ruthless dictator — one who, from 1993 to 1998, ransacked the national coffers, executed activists, and brutalized Igbos. In this reading of Nigeria’s history, domestic politics are also to blame for why Nigeria “can’t progress.” Gen. Abacha stole the country’s future; he left his people broken, disgraced, and mad. Spiders built temporary shelters and nested in our home as the Igbo people believe they do when people mourn, but they took their invasion a step further and invaded our mother’s mind. Mother was the first to notice the spiders and the bulging orbs . . . She began seeing Ikenna spying on us from the carapace of the spiders hanging in the orbs, or saw his eyes looking through the spirals. She complained about them: Ndi ajo ife — These beastly, scaly terrifying creatures. This account muddles the distinctions between memory and hallucination, observation and metaphor. Igbo myths are more than cultural references: they shape experiences and serve as a vocabulary to share them. Stylistically, The Fishermen epitomizes Walter Ong’s influential notion that oral literature embraces “fluency, fulsomeness, [and] volubility” because “it is better to repeat something . . . than simply stop speaking.” Each chapter opens with an animal proverb, like “Ikenna was a sparrow” and “Hatred is a leech,” which gets worked into an extended metaphor. Language in The Fishermen is often stilted (feces is “excreta”), and lines like “his words smashed my resilience into smithereens” crop up repeatedly. Obioma’s attention to folklore also recalls Amos Tutuola’s classic, The Palm-Wine Drinkard (1953), which follows a drunkard on a search for his recently deceased tapster. Like The Fishermen, Tutuola’s novel is a magical memory: the narrator recalls traveling with a “half-bodied baby,” morphing into a bird, and winding up in a “hungry-creature’s stomach.” Some of these rapid-fire fables suggest a moral, but their sheer quantity prevents any fixed reading. Likewise, Obioma primes us for an easy moral or political takeaway — and then leaves us to interrogate our disappointment. Why, after all, do we expect the past be more legible than the present? Surely time obfuscates as much as it clarifies. To me, history is most useful when we admit that it is opaque, untidy, and always greater than the sum of its parts. The best stories respect — and celebrate — this mystery. Gillie Collins lives in New York City. She writes about books, movies, and photography.